January 7, 2005: 13.5 straight hours of hockey, presented by the CBC's mighty Hockey Night In Canada crew. And Don Cherry commentary was limited because he was losing his voice. What a great day. 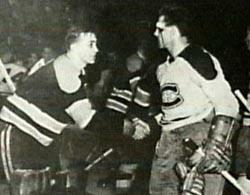 In the afternoon game, Montreal rang up a 4-0 lead in the first period and coasted to a win over Ottawa. The timing was perfect (in the eyes of Habs fans, anyway) for this high-profile game. The Sens have been playing poorly, and their injury crisis was waxing while the DL was waning for the Habs. Ottawa columnist Chris Stevenson describes the Habs' first goal, which was scored on a dreaded 6-on-1 break. When Cherry got his chance to rant, he stood up for Sidney Crosby for a change. Even though Grapes has changed his tune, there are still plenty out there jumping on the kid. He's 18. He just turned 18 in August. If you're old enough, think back to when you were 18. Alexander Ovechkin is 20 - almost two full years older. Think back to when you were 20. Is there a difference between 18 and 20? There sure was for me. Ovechkin may be having the better season (he'd be my pick for the Calder right now), but it's close. Both kids are works in progress, but to declare that Ovechkin is clearly the better player is absurd. Wait a couple of years, then compare Sid's season to Ovechkin's this year. Then we'll all know what's what. Now diving. Some say Sid dives, and I would have to agree. In his defense, he's 18 (see above) and he wants to win more than anything. How is it we can applaud Steve Downie's diving while castigating Crosby? Incidentally, Downie is *four months older* than Crosby. Diving is despicable, no question. But I don't think it's fair to isolate Crosby. Many, many players do it (as a Habs fan, I know all about it). They do it because it works - the chances of a penalty being called on a play are vastly improved if the victim hits the ice. I don't see how acting like you've been pulled down is cheating any more than actually pulling someone down and acting like you didn't. posted by Jeff J at 11:59 a.m.